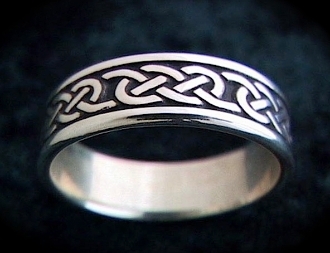 This LOVERS KNOT is one of the most classic band ring patteerns in the realm of Celtic Design. The photo above is of my original men's lovers knot, but I am working on a photo of my newest version, which is what you would be buying if you purchased this ring. The new version is 8mm wide, which is slightly wider than the ring shown, and that extra width allowed me to make the design a bit bolder and more prominent. I also was able to give a slight convex curve to the top radius, which has a more classic band ring effect. I hope to get some usable photos up soon, but the holidays are upon me! This ring is offered in series with a moderate 5.5mm version, generally for women, and a super petite version at 3mm. This ring series is one of my more well developed rings for couples to wear together, or as excellent individual band rings. Although the original scribes and artisans who created the multitude of various knot patters had a motive and reasoning behind their creations, it is not likely that they gave any specific names to the knotwork structures. It is more verifiable that the scribes in particular were working in a devotional mindset, utilizing principles of sacred geometry and general symbolic themes, rather than having every knot be of a specific and unique meaning. That said, the band structures that artists like myself are often exploring for rings etc are often 2 strand paterns. There is theme in these patterns that lend them to principles of connection for folks to wear together. The most overarching theme explains the union of the separate forces of "Spirit" (invisible, heavenly, ethereal) and the "Material realm" (earthly, physical, material plane). Although these separate forces are powerful, the miracle of life occures when Heaven and Earth unite in proper measure. We can extend this to Male and Female, Light and Darkness and other expressions of unity between forces that we can relate to individually.